Edelvrouw Lijsbet de Keukere writes about an event at Aethelmearc War Practice in our canton of Steltonwald in May. If you are a baker, join us! For your passion and skills we want you to show us. 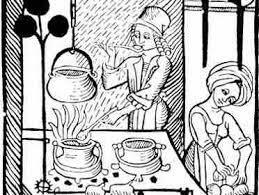 Introducing The Scarlet Apron – a new cooking competition to be held at AEthelmearc War Practice (May 19-22, 2016)! This competition is open to any and all comers who have a penchant for the medieval culinary arts. No matter if you are new to period cooking, or if it is old hat to you, you are welcome at our table! The theme for our inaugural year is sure to be a feast for the eyes as well as the belly – Illusion Food! Anyone wishing to participate must create an example of such a food from anywhere in SCA-period. This could be an interpretation of a subtlety that has been described in a cooking text, or an original creation that can be considered “period-plausible” based on its design, construction and the materials used to create it. 1. The entry should be made and assembled prior to judging – this is not a competition at which contestants must cook their final product on site. 3. The use of period construction techniques, including internal shaping structures and edible ingredients is preferred and encouraged. Registration/sign-in will open Saturday at 10:00 AM. The final judging will occur between 11:00 AM and 1:00 PM, with the winner announced during court that evening. 5. Contestants should provide a brief written overview (one page, maximum) of their entry, including their inspiration (if it was based on a specific subtlety, the original text of its description; if it was based on something else, then those details), a complete list of the materials used, and a description of how they created the structure. 6. Contestants can choose to sit with their entry during the judging period in order to answer questions from the judges and the populace, however it is not required. 7. Plating and presentation are integral to this competition. Each contestant will get no less than half of a six- or eight-foot table, which should be adorned as befits the entry. Entries have three potential categories to win: Youth (for contestants age 5-12), Populace Choice, and Overall Winner. Cooks of all skill levels are encouraged to enter! Any questions should be directed to the competition coordinator, Edelvrouw Lijsbet de Keukere (lijsbet(dot)vandelfthout(at)gmail(dot)com, “Keirin Lazauskas-Ralff” on Facebook). We are so excited about this competition, and are looking forward to seeing the beautiful and delicious pieces of art you create!